Mike is not a fussy eater when it comes to most things, but there is one thing that he will not eat and that is shrimp. The bad thing is that I love the stuff. He has been traveling for work of late, so I have been making a few shrimp dishes for our son Adam (who loves shrimp too) and myself. Until lately I had never really cooked with raw shrimp, so it has been a fun new experience. Last week when Mike was traveling I took a bag out of the freezer and started looking for a shrimp dish to make. 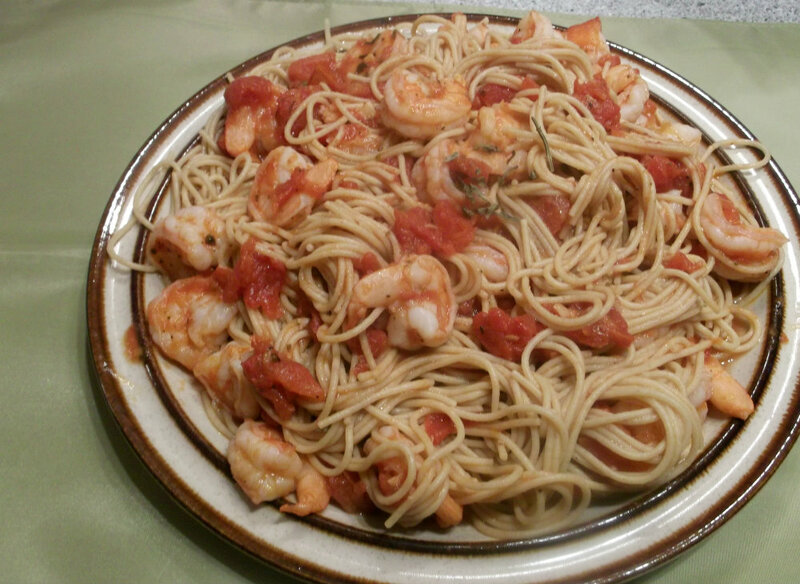 I wanted make pasta with the shrimp, since it is something I have never made before. When I found the Italian shrimp pasta recipe it sounded perfect. I actually made half of a recipe since the recipe suggested that it was 4 servings. Adam and I loved it. It actually made more than 2 servings, but Adam took the rest for lunch the next day, so it worked out perfect. 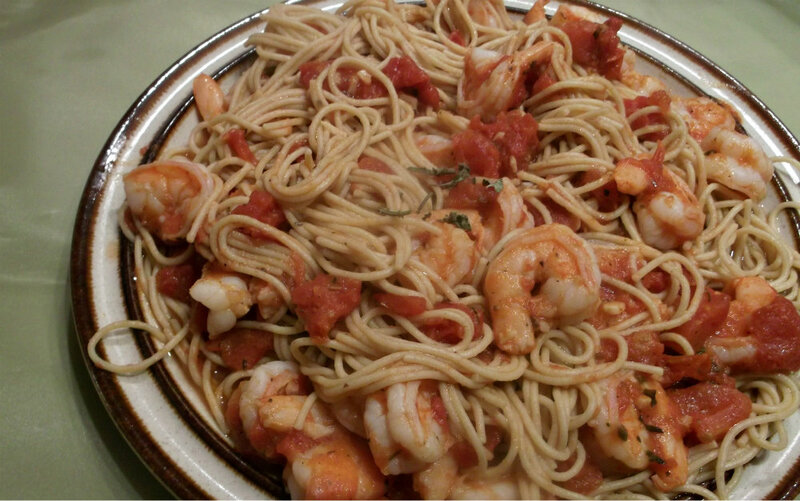 If you like spaghetti and you like shrimp you will love this dish. In a large skillet, saute garlic in oil for 1 minute or until crisp-tender. Add the tomatoes, broth, basil, oregano, pepper, and salt. Bring to a boil over medium heat. Reduce heat; simmer uncovered for 15 minutes. Meanwhile, cook pasta according to package directions. Add the shrimp to the tomato mixture; cook for 5 to 6 minutes or until shrimp turns pink. Drain pasta; toss with shrimp mixture and serve. I love shrimp with pasta too. This dish looks fantastic. Love the simplicity of this pasta dish…and yes, we love shrimps. 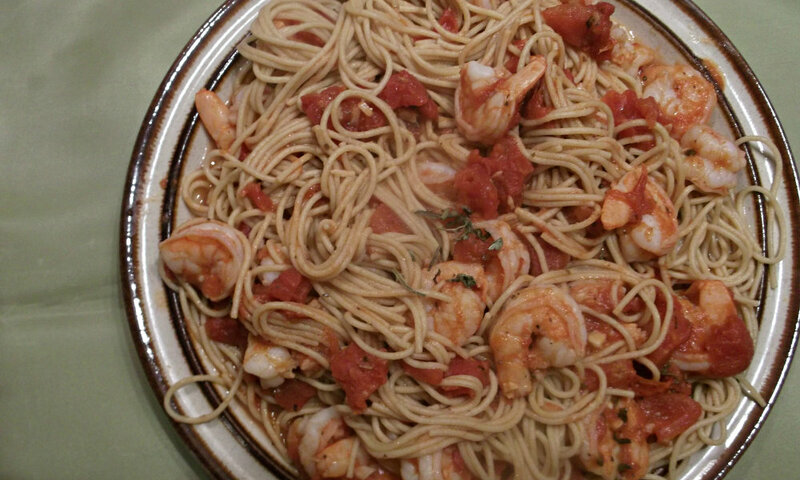 Shrimp works so well in pasta dishes! This looks terrific – and I’ll be it was delish the next day for Adam’s lunch. Good recipe, good post – thanks. Shrimps in pasta are soooo good. It looks great with tomatoes, yummy.